The origins of the University of Bologna go way back, and it is considered to be the oldest university in the Western world. Its history is intertwined with that of the great names of science and literature, it is a keystone and a point of reference for European culture. The main data of the history of the University of Bologna from the beginning to the Bologna Process. 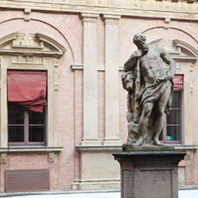 Right from the outset, the Studium in Bologna hosted numerous illustrious guests and scholars. The establishment that we call University today began to evolve in Bologna in the late 11th century, when masters of grammar, rhetoric and logic began to devote themselves to law.